Some photos in this post were taken with my phone. I apologize for the quality but wanted to show you a little bit of what these evenings were like. Tom Douglas is about to open his 9th, 10th and 11th restaurants here in Seattle. And when I say “Tom Douglas” I’m referring to the man himself, but also to his small (but growing) group of talented partners and employees, among them his wife and business partner, Jackie Cross and the gifted and creative chefs that comprise Tom Douglas Restaurants (TDR). It’s hard to believe that Dahlia Lounge, the first TDR venture, has been open 21 years. Within a year or so of its opening I worked at a company headquartered two blocks away. The Dahlia was our go-to business lunch location, as well as the place we treated ourselves when we wanted something special. Etta’s and Palace Kitchen followed sometime later, then Lola and the first serious Pie. At some point in the timeline Dahlia Bakery opened to the public and Palace Ballroom became available for catered events. Most recently Seatown, the second Serious Pie and Dahlia Workshop Biscuit Bar have opened their doors. Opening 11 restaurants in 21 years may not seem all that exciting until you look below the surface. The last three and this soon-to-be-opened three have all come to life within an eight month period. And each restaurant is a unique concept with the exception of two Serious Pie locations. Also, let’s not forget the line of seasoning products, the cookbooks (including one in process), a line of cook’s tools, a new farm and even a wine created by this group – and those are just the things I know about. I’d say it’s been a pretty busy 21 years. The three spots slated to open in early April are Cuoco, an Italian pasta kitchen; Brave Horse Tavern, featuring a pretzel oven (!) and a range of beers on tap; and Ting MoMo, a Tibetan dumpling house. As part of final preparation and testing TDR hosted test kitchen events where Tom, Jackie, Pamela Hinckley, TDR CEO, and staff from each restaurant provided a taste of proposed menu items and solicited feedback on the food and various restaurant features under consideration. 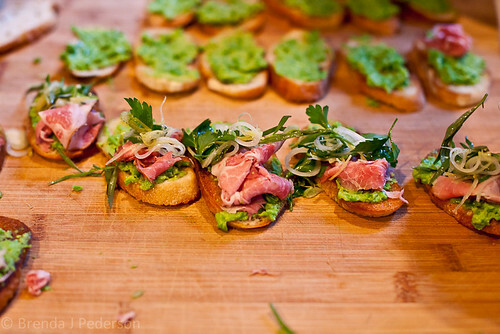 I was able to attend test kitchen events for Cuoco and Brave Horse Tavern. These were great experiences on many levels. First, sampling the food before a place opens is always fun. But even better were the stories and background on the decision-making process; the experimentation to get the tastes, textures and presentation translated from concept to reality; and sharing opinions for decisions still under discussion. The discussions between and among the attendees and staff were lively. 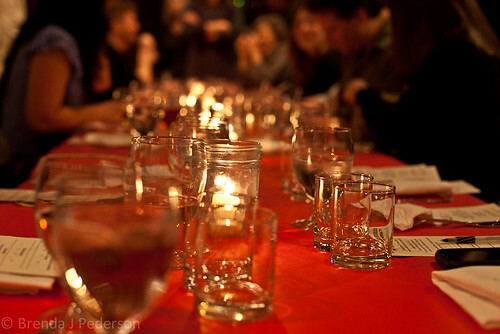 Both nights’ presentations followed similar agendas, with variations specific to each restaurant. 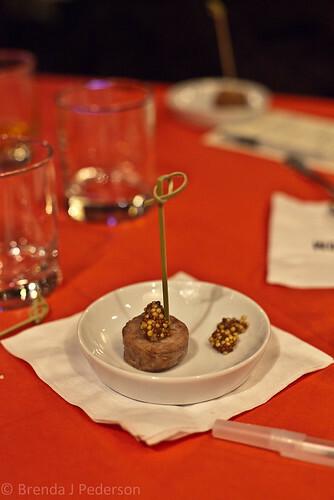 The food samples will not necessarily appear on the final menus but were representative of what will be available. 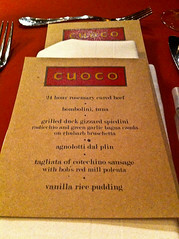 The first tasting was for Cuoco, which means “cook”, the noun not the verb, in Italian. 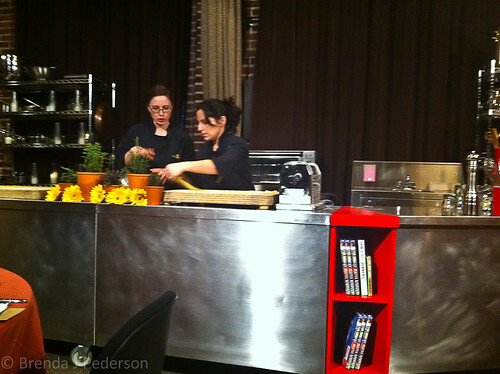 During the tasting two women were busy making Agnolotti dal Plin in a little “kitchen” at the front of the room. Tom provided background on the TDR history and why he continues opening new restaurants. (It’s fun!) Stuart Lane, Cuoco’s chef, talked about his time in Italy, his approach when designing this menu, and areas where he was working to achieve the balance he’s looking for. We sampled Prosecco from a keg (I need this for my parties), and weighed in on whether having a coat check was important to us, among other things. We rated the food we tasted; sometimes getting to choose between two versions; and answered questions about things like music preferences. 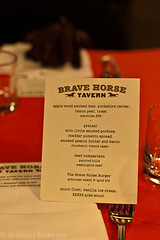 The second tasting was for Brave Horse Tavern. The Brave Horse will feature a pretzel oven and lots of dips to go with the pretzels. Based on the description, it will be the first TDR location that is just as much about the beverages as the food. 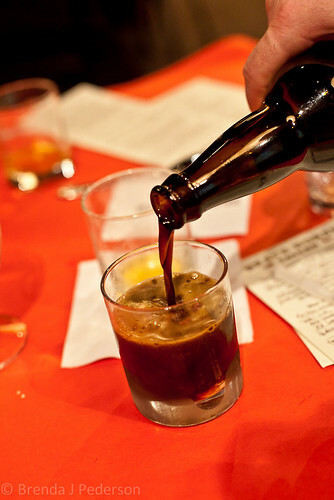 There’s always been attention to the wine list and cocktails but they’re not the main focus at any restaurant. Brave Horse will have 24 beers on tap, and TDR is working with Schooner Exact Brewing Company to create a signature beer. There will be food you expect to find in a tavern setting like hamburgers and sausage; and some things you wouldn’t necessarily expect but make perfect sense, once you see and taste them. Of course, this is a TDR establishment so everything will have its own interesting twist. At this event, Brave Horse’s chef, Brian Walcyck talked about making bratwurst and showed us his process, grinding beef and stuffing casings in the “kitchen” as he talked. He also discussed his love of hamburgers of all kinds. Matt McClung, a Schooner Exact partner, discussed the beer we sampled and what they were creating for Brave Horse. For both events several other folks from the restaurants were in attendance, provided information and were part of the discussion. I wasn’t able to accurately record all their names but their presence was part of what made these evenings interesting and special. I did not attend the event for Ting MoMo but I am looking forward to trying it once open. Something I’ve always enjoyed about TDR is their involvement and interaction with the local community. These sessions were another instantiation of that relationship: fun and interesting for those attending and (hopefully) beneficial research for the TDR group. As of now, Cuoco is scheduled to open April 4. Brave Horse Tavern and Ting MoMo will open one week later. All restaurants are located in the Terry Avenue Building located on Terry Avenue North between Thomas and Harrison streets. The two-story brick building was originally built in 1915 and designated a historic landmark in 2008. Cuoco will occupy the first floor, Brave Horse Tavern the second and Ting MoMo will have its own space on the back of the building. You can see more photos from the events here. Glad you got to go to a few of these. I had a good time at the Ting Momo one. It was very interactive and a great learning experience. I wasn’t expecting to get a hands on cooking lesson so it was a pleasant surprise. I was wondering how many restaurants he had. I knew it was quite a few. He’s a busy guy that is for sure. After going to the first two I wished I’d gone to the Ting Momo event, too. I thought two in a row might be too much but they were so different and interesting. Now I’ll know for next time. ;-) We didn’t get any hands on lessons but I know they were trying to do some “cooking lesson” for each of them. For Cuoco it was the plin and for the sausage for Brave Horse. I guess that one could have been hands-on if I’d volunteered to go up front but I’ve already taken an entire sausage class.